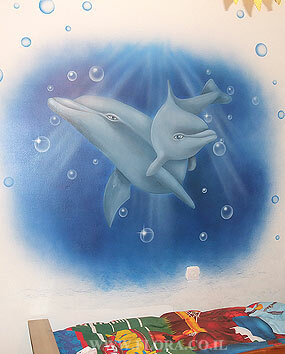 FLORA - MURALS - TEENAGERS ROOMS - DOLPHIN`S REEF - WALL MURALS - DOLPHINS. MURALIST: FLORA. LOCATION: RISHON LEZION. Wall murals - Dolphins. Muralist: Flora. Location: Rishon LeZion.